Depending on where you go to college, you could pull in an annual salary of as low as $44,490 or as high as $122,500 10 years after graduation. While many college graduates are struggling to find jobs, alumni from certain schools are regularly pulling in six-figure salaries. 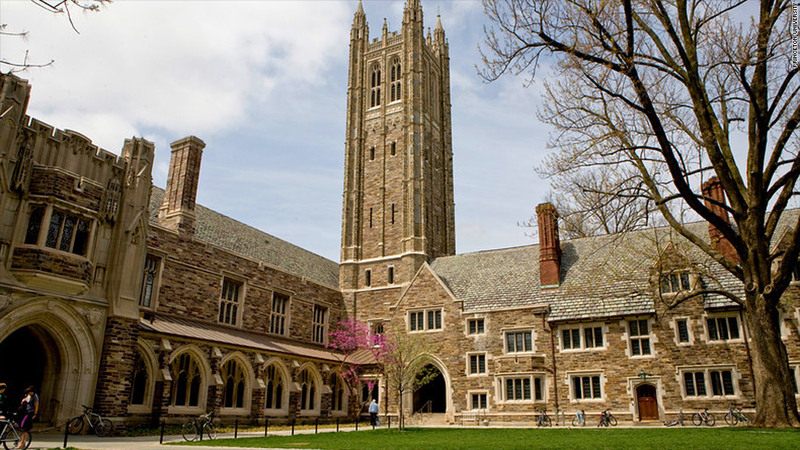 For the second year in a row, Princeton University's students have been pulling in the biggest paychecks, according to new data from salary research site PayScale.com. This year, Princeton graduates with at least 10 years of experience in their field of work are earning an average salary of $137,000. Rounding out the top 10, are Harvey Mudd College, California Institute of Technology, the United States Naval Academy at Annapolis, the United States Military Academy at West Point, the Massachusetts Institute of Technology, Lehigh University, the Polytechnic Institute of New York University, Babson College and Stanford University. Graduates from these schools earned an average mid-career salary of $122,500 -- up 5% from last year. This year's increase follows three years of declines, according to PayScale. The schools with the highest-paid graduates typically fall into one of two categories: They're either engineering schools, since engineering is the highest-paid major, or they're very prestigious, so companies tend to recruit these grads first -- and pay them handsomely -- when making hiring decisions. "Not only do [the most prestigious schools like Stanford] offer high-paying majors as well, but there's a level of notoriety that allows people to move into jobs more easily and get higher-paying jobs, and there's also a strong alumni network that helps you get jobs," said Katie Bardaro, lead economist at PayScale. Graduates earn the highest starting salaries at the United States Military Academy at West Point, where alumni with five years of experience or less make an average of $76,000. The United States Naval Academy at Annapolis and Massachusetts Institute of Technology follow, with average starting salaries of $72,200 and $68,400. Among the 10 schools with the lowest-paid graduates, the average mid-career salary remained steady this year, at $44,490. The five schools with the lowest-paid graduates were The Art Institute of Pittsburgh (the online division), Benedict College in South Carolina, Mississippi Valley State University, University of the Cumberlands in Kentucky, and Bethel University in Tennessee. Lower earning potential is common among schools that offer traditionally low-paying majors, like art, said Bardaro. These schools are also often located in areas with lower cost of living, and many don't carry the same level of prestige as the top schools on the list, so it can be hard for students to stick out in a big stack of resumes. Majors with the biggest pay-offs: The highest-paying majors this year were petroleum engineering, with an average mid-career salary of $163,000, followed by aerospace engineering, which pays an average $118,000. Meanwhile, child and family studies majors can work for more than 10 years in their field and still only earn an average $37,700. Social work is the next lowest-paying major, with a mid-career salary or $45,300. "In today's economy, you really don't know whether you're going to be finding a job or not, so you want to be aware of the pay you can make -- don't go to a school that isn't going to give you the return on investment you would hope for," said Bardaro. "[Y]ou don't want to take out $100,000 in debt to get a job that pays $40,000 a year." But pay isn't the only factor to take into consideration -- there's a reason so many people continue to pursue less lucrative majors and careers, she said. While you may have to sacrifice the glamorous lifestyle, these jobs are often the ones that graduates say have the most positive impact on the world around them. For example, the college with the highest percentage of graduates (97%) who reported that their work makes "the world a better place" is Florida Hospital College of Health Sciences. However, these graduates are earning far less than their Ivy League or engineering peers. On average, they earned mid-career salaries of $71,100 and starting salaries of $52,000, according to PayScale's data. Among the most meaningful majors are nursing, special education and medical technology, while graduates felt the least meaningful majors were film production, fashion merchandising and fashion design. To help college-bound students choose the school that best fits their priorities, PayScale launched a College Selector Tool on its website this week where you can plug in different criteria -- like earnings potential, cost, financial aid availability and religious affiliation -- and receive a list of the most relevant results. If you want to go to a big party school but still want to make good money when you graduate, for example, the University of Illinois at Urbana-Champaign will fit the bill, according to the tool. Not only will you get to party you're your way through your college years, but mid-career salaries average a decent $95,000. Correction: A previous version of this story identified Stanford University as Stanford College. Have you defaulted on a student loan? E-mail blake.ellis@turner.com to share your story.